More Scotch today from my Bristol Whisky Lounge session. In a surreal moment I asked the Diageo ambassador with the megaphone (Colin Dunn I think) if the Clynelish Select Reserve was a token for a taste. He replied it was a few tokens. Probably should have taken him up on that, but saved my money in the end. He offered me this instead. 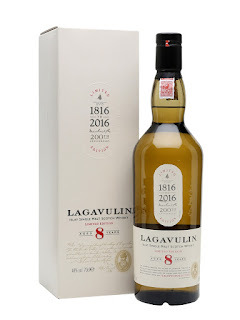 Lagavulin's new release for their 200th anniversary. Nose: Very light for a Lagavulin, very bright too. Fruit, lime, lemon, oil, pineapple, lime juice. Taste: Light, some fruit, lime, building oily smoke, very oily, soot and lime. Balanced. Finish: Medium length. Lime zest and olive oil. Notes: Good young Laga. Very similar to Cask Islay. Great they kept it at 48% too, but Cask Islay is very similar for £20 less.